Sheet masks have recently become more common in my skin care routine. I like to mix things up and try new masks regularly, and sheet masks are the perfect way to do that without buying jars of a formula you don’t know if you love yet. Plus, I do feel like I end up getting more of the mask sinking into my skin with a sheet mask, since the top layer doesn’t dry out while wearing it. 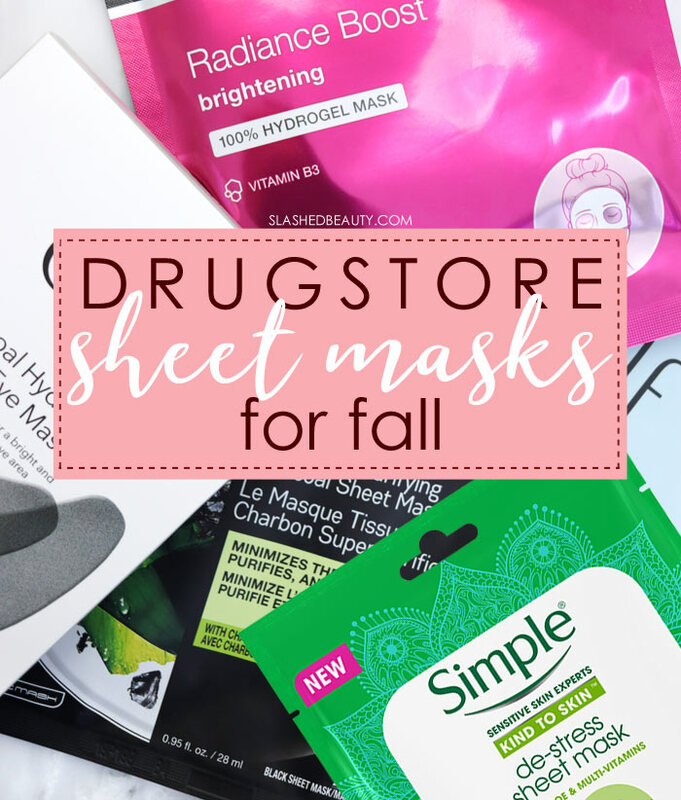 So as fall approaches and the weather is about to do a number on my skin, I’ve got a few of my favorite sheet masks on hand for some TLC and weekly pampering. This is probably my absolute favorite drugstore sheet mask, because I can feel a difference instantly after letting it sit on my skin just once. It’s made with multi-vitamins and aloe, with a cooling effect to help reduce puffiness while delivering a major boost of hydration. After using this mask, I can tell that my redness is greatly reduced, my skin looks and feels calmer and looks super glowy. Purified water, aloe and hyaluronic acid make this sheet mask perfect for a quick but powerful moisturizing pick-me-up. Cruelty free and vegan, this feels great both before bed or in the morning to combat a dull and dry appearance. It leaves a layer of serum once you’ve taken it off that you can rub in to maximize the benefits. The sheet itself is very thin and flexible to ensure a comfortable fit that won’t slip! Ya’ll know that I struggle from acne, so purifying masks are my jam when I’m feeling a bit clogged up. The charcoal and algae extract in the formula draws out impurities clogging the pores, and there’s more than half a bottle of hydrating serum in one face mask. It’s free from mineral oil and non-greasy with a lightweight feel great for all skin types. In 15 minutes, you’re left with smaller looking pores and a deep cleaned feel with a radiant glow. If sheet masks often bug you because of how they sit on the face, this might be your new favorite way to enjoy them. The mask is made of hydrogel instead of paper, so it completely contours to your skin and seals in the formula. Plus, it comes in two pieces: one piece that goes from the chin to middle cheek area, and a second piece that goes from the cheekbones to the top of the forehead. This means you get maximum coverage and comfort. This formula is made with Vitamin B3 and is non-comedogenic and really wakes up dull skin after 15-30 minutes on. This mask is great if you are trying to brighten hyperpigmentation and acne scarring, and I can see a difference after using it regularly on my stubborn dark spots. It also helps even skin texture as well as tone. These masks are specifically for the under-eye region, which often get ignored with traditional sheet masks with the wide cut-outs. 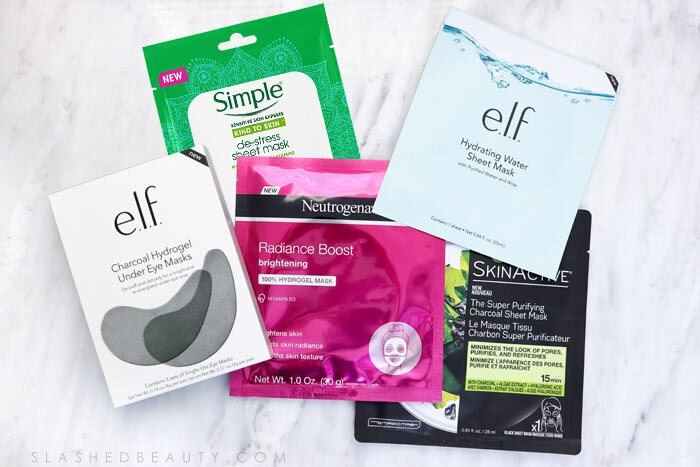 The Charocal Hydrogel Under Eye Masks from e.l.f. help detox the skin under the eye to de-puff and detoxify. They brighten the under-eye area so you won’t be caught wearing last night’s festivities on your face. Perfect for the morning before makeup application, and I’ve been known to rock them on long flights, too! What are your favorite sheet masks? Let me know in the comments below! And now, for the best blog posts of last week from The Lipstick League.